2017 saw tech-forward sneaker collections, idyllic innovations and fun toys that kept us entertained — we were influenced and impressed even if we only got to eyeball them from afar. Now, as we come into the final weeks of the Christmas shopping blitz, remembering all that came out this year is a task that takes serious time and effort, and you simply may not have much of that right now. Thankfully, we’re all over the tech hashtag and used our undeniable Lois Lane investigative skills to get the lowdown. Here are the 15 items we’re most excited about this holiday. Does your hand still shake constantly when you’re trying to snap that perfect shot of you and your dog? Are you always asking others to take the photo because they do it better? Well, now you might be able to feel more confident in your st[ability] with this cool attachment for your iPhone. Basically, the Pictar attaches to your phone, and its ergonomic grip helps control those shaky photo moments. Delete less photos while also adding some serious functionality to your photo game — there’s five buttons to help you “DSLR your Phone” as the company’s slogan suggests, making it easier to customize. The latest edition in the Note series is a special one to think about grabbing this year, especially if you enjoy supreme visuals. Boasting one of the biggest screens (6.3 inches), the Note 8 wants you to enjoy multimedia in the fullest capacity and with a screen that big you may forget about your tablet or TV altogether. This is the first device that features optimal image stabilization on both the main and the zoom lenses so you have way more control in the way photos are taken, and displayed. You can adjust the live focus after the fact, pinpointing specific areas on the photo you want to define and others you want to leave blurry for aesthetic. It’s water-resistant, can be charged wirelessly, has 6GB of RAM plus expandable storage (a big plus! ), Bluetooth 5.0, and you still get a headphone jack. You can use the S-pen to create memes and go in full doodle-like mode too. It truly is a beast of a phone that has a ton of nifty features to make creativity blossom. Tom DeVesto’s latest audio company, Como Audio boasts high quality products at affordable prices. The Solo is a well-designed device that comes with a clock, dual alarms, FM tuner and includes the ability to stream local music files, or use Bluetooth to connect to Spotify or internet radio. It’s anything but one-dimensional. We’re also really digging the colour options, which range from white to hickory to walnut and black finishes. The Solo isn’t a wonky piece of gear either, so don’t expect anything cheap out of the box; its sound and design are nicely married. If you’re on the hunt for a truly impressive listening experience, you’ll dig this mighty guy. If you’re like us, you love a good stretch to relieve muscle tension, but sometimes you need more help than your own body can provide. Enter the Vyper 2.0, the world’s most powerful heated fitness roller that pretty much demolishes those gym tubes you’re always trying to make work. Sometimes no matter how much you grind your side into rollers, they just don’t hit the spot you need and worse yet, you end up straining your muscles in the process. The Vyper’s design allows for easy rolling and mode adjustment, and if you’re looking for even more targeted muscle attention with a lower price point, check out the Hypersphere. Each of the Hyperice products rely on ice compression technology in the form of a compression wrap and an ice cell that removes air from it in order to direct ultimate therapy to the muscle. Use it on your legs, ankles, back or sides. This is the perfect gift for the athlete, former athlete, fitness enthusiast or everyday user that wants to release some unwanted tension in their lives. If you register an account here, you’ll receive 10% off your purchase. The device has sold 10 million units in less than nine months and surely that number will increase following the holiday season. The Switch is great for home play as well as on-the-go and it can be used much like a tablet (just put it on sleep mode) as it’s fast and intuitive, too. It isn’t locked to a region, so you’re able to snag various games (like Zelda) regardless of where they’re sold (something that Nintendo wasn’t always so keen on in the past). The battery is said to last up to six hours, and expect more video entries to be added to the Switch arsenal in 2018. Keeping coffee the right temperature is often a complete game of luck; you guess and end up with a burnt lip or you wait too long and the lukewarmness makes you cringe. This mug, however, holds up to 10 ounces of a hot beverage while maintaining its perfect temperature, which can be controlled by using the Ember app. The app actually notifies you once the temperature has hit that sweet spot, so you just need to sip and savour. Through a system of cooling and heating convection, the liquid is moved up and down to meet the desired requirements, and the end result is coffee that’s drinkable anywhere you can hold the mug. The “world’s first temperature control mug” was named one of the best inventions of 2017 by Time. For fans of indie horror games, you need to play this game. The 3D sly-stealth game focuses much of its attention around lead protagonist, Six, and instead of other names in this genre (think Slender or Tattletail) Little Nightmares is not played in first person. Each player can take a shot at helping Six navigate through the eerie, otherworldly zones which do confuse — is it a dream or a nightmare we’re in? Help her escape from the creepy ‘things’ and the mysterious vessel she’s been trapped on all while you “play with your childhood fears” along the way. We’re only hours into the fun, but we’re definitely hooked. The game is available on Xbox One, PS4 and PC (via STEAM). We’ve listed plenty of toys and equipment that will help entertain you, but what about technology that actually helps you rest? Tom Brady’s sleepwear feels like this upon first wear: light, silky and cozy — you wouldn’t even know the bioceramic print on the inside absorbs natural heat and “reflects FAR infrared back to the skin” so you recover and sleep better. If you have to choose only one item, go for the pants, you won’t be disappointed. Sizes range from XS to XL. Finally you can get a kindle that’s waterproof, meaning bubble baths are going to get even better in 2018. The battery life lasts for weeks rather than hours and you can zap into the fast-charging function and power up your device from no battery to fully charged in less than two hours. Audible is built in so you can listen to a bevy of audiobooks whenever you want. The 7-inch screen, 300 ppi display, over 30 per cent more words per page and general quickness and responsiveness of the device make it a premium gift idea for any bookworm. Kikkerland has a bunch of offerings that aim to improve (or make fun of) life, one gift at a time. Take this hat for example: can’t you see your dad sporting this at night in the cold while he ventures to Quickie to get lotto tickets? Or how about that friend who always has to shovel, but can’t see a thing in front of them? Got a cyclist on the wishlist? An outdoor runner? Whatever the purpose may be, there’s real use for a hat like this and at the price, seriously, why not? If you’re looking for a powerful speaker that can be taken basically everywhere, you’ll find just that with this Bose Micro. The speaker measures 3.75 inches wide and 1.5 inches deep – basically a handful in size and weighs in at less than a pound. This is Bose’s first entirely waterproof speaker that comes with Google Assistant or Siri accessibility, too. You can get the Soundlink Micro in blue, orange or black. It’s well designed, has a 6-hour batter life, and provides clear sound that’s easily to set up play and get addicted to. We greatly appreciate the back strap where you can place your palm through for added grip, too. Actually, we appreciate everything about this speaker–our showers are so much better! You can have all the coolest stuff but if you can’t find solid storage for it all, losing or breaking something is way more likely to happen. 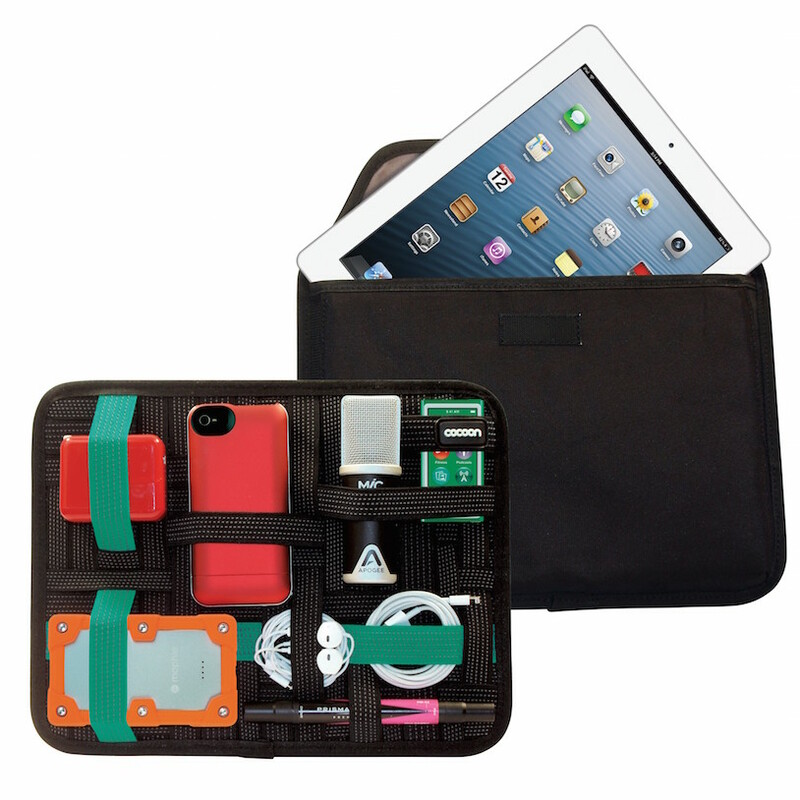 But don’t worry, this sweet organizer helps sort all the essentials from chargers to cords to headphones or that USB, and the rubberized elastic pockets are sturdy and keep things intact. The back pocket also fits tablets such as the Google Nexus 10, the iPad and the Samsung Galaxy Note 10.1, among others. Anyone that’s constantly lugging all their gear around or gets really excited over organizing will probably cry with joy when they see this. Get ready. The Sonos One is probably on a majority of lists this year—and rightfully so, they’re the first voice-enabled speakers (coming to Canada in 2018, though.) If you’re truly looking to impress, this is certainly a gift to consider: it’s sleek, fits easily on surfaces, and most of all, is exactly the type of sound experience you’d hope for. They live up to the hype, tenfold. The time for usb charging is over guys, wireless charging is the now. Belkin worked with Apple to design this, which is optimized for the iPhone X, iPhone 8 Plus and iPhone 8. Trust in a company that’s been putting tech at the forefront of its design mandate for over 30 years. These waterproof, sweatproof and dustproof headphones are a great buy for the quality you’re getting. The inner part that wraps around your ear can be played with to fit to your liking and the in-ear canal groove helps to block out noise while enhancing your music. There’s also an omnidirectional microphone that can be used regardless of where you’re positioned — its sound sensitivity is strong. For under $50, you won’t find a better pair that looks this good.